BRISBANE, Australia --- Airbus has been awarded an extension of the Australian Army’s Armed Reconnaissance Helicopter (ARH) Tiger through-life support (TLS) contract by the Australian Department of Defence. 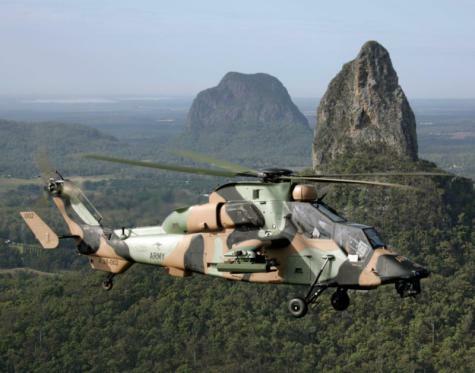 “Airbus is committed to ensuring the success of the Australian ARH Tiger fleet, and we have worked closely with the Australian Army and our industry partners to improve the fleet’s performance over many years,” he said. The two-seater ARH Tiger attack helicopter serves as a key asset for the Australian Army. Today, the fleet of 22 ARH Tiger has flown over 30,000 hours, deployed for day-and-night surveillance and fire-support missions. Globally, 181 Tigers have been delivered to Australia, France, Germany and Spain, and have accumulated over 115,000 flight hours to date. First deployed by the French Army in Afghanistan in 2009, the Tiger continues to demonstrate its essential role on theatres of operation as a highly versatile, stealthy, and maneuverable attack helicopter. Airbus is a global leader in aeronautics, space and related services. In 2018 it generated revenues of €64 billion and employed a workforce of around 134,000. Airbus offers the most comprehensive range of passenger airliners. Airbus is also a European leader providing tanker, combat, transport and mission aircraft, as well as one of the world’s leading space companies. In helicopters, Airbus provides the most efficient civil and military rotorcraft solutions worldwide.